(Have you ever had your drink served by a nymph hanging from the ceiling. Come to #CarpeMomentum and the answer will be YES! Make sure your camera phones are charged! You are going to want to Seize, Savor, Share and Save The Moment as balloons and dancers gracefully fall from above your glow sticks and drinks waving in the air. Just check out Modern Luxury's typical party to the left and now imagine that x10! Join Celebrity Dj Baby Yu and others for an amazing night! Joining us from L.A is North America's most experienced, versatile, and well respected Celebrity @DjBabyYu ! Seize the moment and join @DjBabyYu for a #StudioWestNYE! Dj Baby Yu is the #1 choice for several Celebrities! You never know who will show up on NYE! 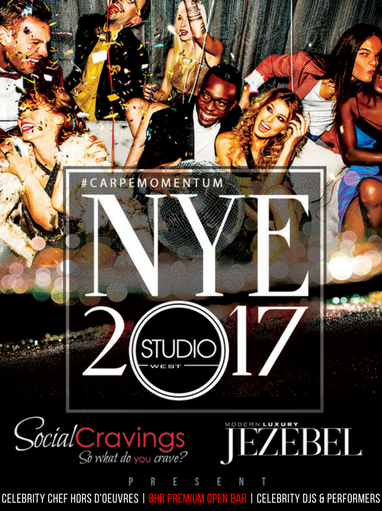 Spend New Year’s Eve 2016 toasting the beginning of 2017 with Jezebel Magazine at the GRAND OPENING of STUDIO WEST; a new and luxurious event center in midtown Atlanta! You can toast the night away with a complimentary 8 hour Premium Open Bar of ABSOLUT ELYX, TEQUILA AVION, MARTELL, MALIBU RUM, and handcrafted libations! Celebrate hard-won victories of the previous year with an all-VIP crowd of influencers, creatives, bosses, movers, shakers and generally amazing people like yourself. Doors Open. Red Carpet Arrival. Papparazzi. Cocktails. Celebrity Chef Virgil Harper's delectable bites will be served. enjoy every morsel with a cocktail by. Did we forget to mention its an 8 hr open bar. IT’S 2017. HAPPY NEW YEAR! Guests will enjoy a spectacular night with an all-night premium open bar, gourmet hand passed bites by Celebrity Chef Virgil Harper, live performances, Celebrity DJs, and luxury gifts. Self and Valet Parking is available. *All guests must be 21 and over to attend. Each ticket admits one guest and is non-transferrable. Please drink responsibly. Valet and Self Parking available. Get your parking voucher in advance! THIS IS WHAT CELEBRITY DJ BABY YOU DID FOR NYE LAST YEAR!